Estimated value (2014): $15 million *Adjusted for inflation & value appreciation. Google Trends: Not ranked high enough for considerations. History: This painting was sold to a private collection in 1990 for $5.5 million. Tsuguharu Foujita was born in Japan and graduated from the country’s National Institute of Fine Arts. But he spent most of his life living and working in Paris. This might explain the fusion of Eastern and Western styles often found in his art. Foujita was known for his use of outlines and various ink techniques. Young girls are popular subjects in the Japanese's paintings. Innocence and youthfulness are the prevailing themes in these works. 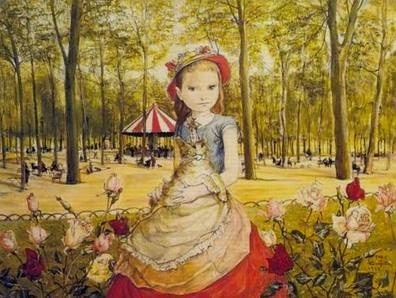 "Young Girl in the Park" is arguably the best of the bunch. Foujita completed this work at the age of 71. Foujita was a master composer of lines. The painting was stylized to look more like a sketch than a painting. The outlines were painted with precise brush strokes, with the colors being added later. Note how the use of lines allowed the artist to superbly express the girl’s youthfulness and innocence. Also, there is a high level of details in the background -- the park visitors, trees, colorful roses. Although the setting is in Paris, there is clearly an oriental influence.